Often mentioned as one of four knuckleball pitchers on the Washington Senators staff of the mid-1940s, Johnny Niggeling gained the reputation as a baseball nomad long before securing a position with the Cincinnati Reds in 1939. His epic journey spanned nearly two decades, playing in ten different leagues, punctuated with two brief chances in the majors. Finally, at the relatively old age of 36, the tall right-handed pitcher took root in the big leagues, first in the National, and then the American League. His unique side-armed throw of a one-finger knuckleball allowed him to prove his value in the Queen City. From there, he spent his best years with the St. Louis Browns, followed by a good stand with the Senators, and lastly a short stint with the Boston Braves of 1946. And though eight years constitutes a full career in sports, a recurring stomach ailment ultimately claimed his baseball career. Nonetheless, the name Johnny Niggeling continues to surface among baseball aficionados living well beyond the boundaries of Northwestern Iowa, his home base. John Arnold Niggeling was born July 10, 1903, in Remsen, Iowa, to German-American Henry Niggeling and Luxembourg-born Mary (Wauderscheid) Niggeling. The youngest of the couple’s nine children, John had four brothers and four sisters. His father supported the family on his earnings in law enforcement in Remsen, a small Plymouth County town bounded by Iowa’s ubiquitous cornfields. There, the future major league ballplayer grew up and lived most of his life. While attending the town’s St. Mary’s High School, he excelled at basketball as well as baseball. A good hitter, he mostly played the infield then, although, later in life he mentioned that he also did some pitching for St. Mary’s, unwittingly forming the rudiment of his famed knuckleball. He claimed that he never developed it, it just happened. Following high school, he played either short or second for Remsen’s home team, as well as clubs from the nearby Iowa towns of Spencer, Storm Lake and Cherokee. When not on the ball field, he earned a living as a barber in area shops, an occupation he maintained throughout his adult life. Niggeling signed his first professional baseball contract with the Nebraska State League around 1926. His big opportunity came in 1929, when he landed a position with the Waterloo Hawks of the Class D Mississippi Valley League. After playing 40 games at either short or second, happenstance caused by a dearth of pitchers landed him on the mound one day. He put in such a good showing then that he continued in that position for the remainder of his playing days. He ended that season with a won-loss pitching record of 15-4, and the league leading W-L% of .789. His hurling prowess drawing notice, the gangly six-foot lad from Remsen moved up to the Class B Three-I League Evansville Hubs the following year. By then, sportswriters called him Johnny rather than John or Jack as in the past. Ever a respectable batter, he closed the season of 1930 with a .289 batting average, but his pitching skills took precedence with a 19-10 2.89 record. From Evansville, he rose in the ranks to the Des Moines Demons of the Class A Western League of 1931. While with the Demons, Johnny won 17 and lost 12 on the mound, and although his batting suffered, he did tally three home runs that season. In one game with Pueblo, his own mental lapse cost him a perfect game. Because he failed to cover first, one batter reached base safely on an infield scratch. But Des Moines won the game 6-0, delighting a crowd of twenty-one hundred. Niggeling and his knuckleball, the pitch sometimes called a butterfly or a flutterball, already legend, the National League Pittsburgh Pirates purchased his contract that fall. He looked promising during spring training in 1932, and he even joined the Pirates staff on its first road trip of the season before the home opener. Unfortunately, he never had a chance to play. In April, when the Pirates played in Cincinnati, Johnny suffered an acute gastric hemorrhage, and was admitted to Cincinnati’s Christ Hospital. As the Bucs moved on, Johnny remained there for nearly a month, requiring several blood transfusions. That sidelined him from baseball for the rest of the season, but it did not deter his athleticism. Sometime during his recovery period, he bowled a perfect 300 game at a Remsen bowling lane. An avid sportsman, throughout his career he wintered in Remsen, hunting and bowling when not barbering. He usually attended the Iowa state bowling tournaments. Back in shape in 1933, he joined the Wilkes-Barre Barons of the New York-Pennsylvania League. Performing well there, he tallied 8-6 with a 3.06 ERA. Then, after a brief stay with the Nashville Volunteers, he ended the season with the Kansas City AA American Association Blues, winning only 4 of 15. Moving on, he played most of that 1934 season in Reading, Pennsylvania with the Red Sox of the NYP league. Up to his usual standards, he finished there with a 17-9 won-loss record. Closing out that season, he lost one game during a short stay with the Blues in Kansas City. Resuming his itinerant life, he spent the season of 1935 with the Oklahoma City Indians of the Texas League, then 1936 and part of ’37 with the Blues again, and part of the season of ’38 with the Newark Bears of the International League. But his roving did not hinder notice from the scouts. He fared well at each stop, his best with Kansas City, where he posted an 18-15 won-loss record in 1936. In 1938, he got his second shot at the majors when the NL Boston Bees took him on. For that club he made two appearances in relief, getting one decision by winning in Philadelphia on April 30. Soon, he was shipped down to the AA Indianapolis Indians where he played well for the rest of the season. While he pitched for Indianapolis, a revealing profile of the quiet Midwesterner began to emerge. Often referring to him as “Long-John” during that time, media descriptions of him portrayed a meticulously dressed gentleman with deep brown eyes. His imposing height and strong, gentle persona put many in mind of screen legend Gary Cooper. Never known to utter unkind words about anyone, he possessed a keen sense of humor. During the off-season, he lived alone with his mother, his father having passed away in 1934 after his older siblings had all left home. That surely describes a most eligible bachelor in any era. Yet, he never lost focus on his pitching. He won 14 games for the Indians in 1938, and after winning 15 by mid-season in 1939, he got one more call to the majors. This time he stayed for more than a cup of coffee. After returning from an Indians road trip, Long John received a telegram instructing him to report to the NL Cincinnati Reds the next day. At first, he thought his teammates were playing a joke on him. He just couldn’t believe his luck, getting a third shot at the majors. The notice was real, and he went on to win two and lose one for the Reds that August. As it happened, the one he lost was to the Dodgers at Ebbets Field, which happened to be the first baseball game broadcast live on television. Brooklyn’s announcer at the time, now-famous broadcaster Red Barber, announced the game on NBC’s experimental station, W2XBS, which became WNBC-TV. Home viewers witnessed Brooklyn win 6-1 against Cincinnati’s 36-year-old rookie in the second game of a double-header on August 26, 1939. Cincinnati claimed the NL pennant that year, losing four straight to the Yankees in the World Series. However, the newly acquired knuckleball pitcher was not given the opportunity to help. He watched each game from the bench. Then, over the winter that followed, the AL St. Louis Browns obtained Niggeling on inter-league waivers. His stay in the Mound City lasted longer than any other engagement of his career. Approaching his thirty-seventh birthday that spring of 1940, the seasoned butterfly twirler came as a welcome relief to the hapless Browns. Mired in and around last place for nearly a decade, the club hoped to gain some respect. 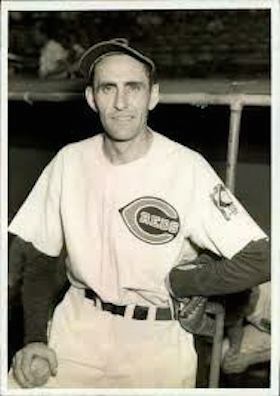 Although1940 was not his best year, Niggeling helped strengthen the St. Louis pitching staff, playing the role of spoiler against the league leaders. In Cleveland on August 17, he put in a fine performance, allowing only five hits in a game lasting under two hours. The Browns scored two while Johnny held the Indians to one run. That not only ended a five-game losing streak for the Browns, but also stopped first place Cleveland’s five-game winning streak. Later, in St. Louis at Sportsman’s Park on September 15, he beat the Yankees out of second place, winning against Red Ruffing, 10-5. But he had yet to fool Joe Di Maggio with his knuckleball. That day Joltin’ Joe went 3 for 5, with one home run and a double. Niggeling finished his first season with the Browns with a losing record of 7-ll, but the Browns moved up to sixth place, the club’s best finish in six years. The Browns kept him on in 1941, and he did show some improvement, although winning just seven again. However, during that season he began to gain status as the Red Sox jinx. More than half of his wins were at the expense of second-place Boston, which forecast his dominance over that club for the rest of his career. But he always felt intimidated by Boston’s celebrated Ted Williams. In a quote echoed more than three decades later by Hollywood’s Rocky Balboa about his opponent Ivan Drago in Rocky IV, Niggeling commented about Williams to sportswriter Henry P Edwards, “That guy is not human.”1 He explained that he’d thrown the Splendid Splinter everything in his repertoire, but the only way he could stop him was to walk him. Years after he retired from baseball, Johnny told Le Mars, Iowa barbershop owner Don Curry that Williams was the greatest hitter he ever faced. Regardless of his problems with Boston’s left-fielder, Niggeling’s pitches, primarily knucklers and fastballs, started to perplex Joe DiMaggio. On the heels of the Clipper’s 56-game hitting streak during the season of 1941, he started working on another. But after 16 games, it came to an abrupt halt in New York on August 3 when he went 0 for 4 against the lanky Iowan. Such performances kept Niggeling in the Browns’ lineup the following season. Eventful in his professional, as well as personal life, 1942 proved a memorable year for Niggeling. In Le Mars, Iowa on February 2, 1942, 39-year-old Johnny Niggeling married 24-year-old Ruth Puglesa from Del Rapids, South Dakota. Ruth had been employed in the town of Le Mars, eleven miles west of Remsen. The couple honeymooned in Pensacola, Florida, where the groom reported for the Browns spring training. Marriage seemed to agree with the aging athlete then, as the season to follow proved the best of his baseball career. He ended it with a 15-11 won-loss record and a 2.66 ERA. Six of those victories were over Boston. That aided the Browns progression to third place. After that season’s end, Niggeling informed the club that Uncle Sam had rejected him for service. Earlier, he had expressed his desire to serve in the armed forces. And although he did not disclose the reason for the turndown, it was most likely because of his persistent stomach problems. In March 1943, he reported to the Browns underweight “due to a recent attack of his old trouble, stomach ulcers.”2 In an effort to get back up to his normal 170 pounds, he drank a bottle or two of beer every day. That remedy was common in baseball during that era. In fact, it was encouraged. And, if one considers alcoholic consumption a vice, that may have been Niggeling’s only one. It was said that he never swore, and that he chewed gum instead of tobacco. However, one news photo does show him gripping a cigar with his teeth while waiting out a game delay in his hotel. Regardless of Johnny’s health or personal habits, his 6-8 won-loss record with St. Louis in 1943 does not reflect his skill. A look at his 3.17 ERA, and the low scores of the games he lost shows a lack of support on the field. Late in August, the Browns made a deal with the Washington Senators: third baseman Harland Clift, and for good measure, Johnny Niggeling in exchange for infielder Ellis Clary, pitcher John Miller and $30,000 cash. Accustomed to being traded, the knuckleball hurler finished out the ‘43 season with Washington, winning four and losing only two with a superb 0.88 ERA. In late September Shirley Povich wrote “Niggeling has allowed less than one run per game, earned or unearned, in his five outings. He is the best pitcher on the club.”3 During that period, Johnny actually had a streak that stretched across two seasons. Playing for the Browns, and then the Senators, he pitched 13 straight games with 7 innings pitched and 2 or fewer earned runs. Of course, that was during World War II, when a lot of great batters, such as Ted Williams, were in the service. Nonetheless, the next pitcher to achieve such a 13-game streak was Tom Seaver, who joined the majors more than 20 years later. Niggeling so impressed Senators manager Ossie Bluege that he was chosen to start the Opening Day game at Griffith Stadium in 1944. On April 18, before a crowd of 27,000, United States Vice President Henry Wallace, standing in for President Roosevelt, delivered the ceremonial first pitch. The visiting Philadelphia Athletics faced a Senators battery of a combined 79 years, Niggeling’s age combined with that of catcher Rick Ferrell’s. That set an Opening Day battery record not broken until 1989, when White Sox duo Jerry Reuss and Carlton Fisk, whose shared ages equaled 81, teamed up against the Angels in California. At the Washington opener in 1944, forty-one-year old Johnny Niggeling pitched 11 quality innings, giving up only six hits and one earned run. Milo Candini relieved him in the twelfth, and lost the game, 3-2. Johnny’s former Brownie teammate, and future Hall-of-Fame catcher Rick Ferrell, had his work cut out for him that season and the next. The Nats carried four knuckleballers during that time: Roger Wolff, Dutch Leonard, Mickey Haefner and Johnny Niggeling. Catchers abhor that pitch, and for good reason. Ferrell succinctly explained by later saying, “ …every game was an adventure…When they released the ball, they didn’t know where it was going and neither did I.”4 The ball would just float up to the plate, thereby giving it the butterfly or flutterball designation. Johnny’s ten wins that year didn’t count for much as far as the club was concerned, as Washington finished at the bottom. Recovering nicely from that forgettable season, it did climb up to second by the end of 1945. And although Niggeling’s losses outnumbered his wins that year, he was still pitching well, judging by his 3.16 ERA. Unfortunately, during the off-season his ulcers flared up again, requiring surgery. That cost him some weight loss, but he did gain enough back to join the Nats at the beginning of the ’46 season. However, he required at least six days rest between starts. Not up to his usual standards, he was given his unconditional release after an especially poor performance in June. Early in July, he was optioned by the Boston Braves. However, his stay there was cut short when he requested his release because of his ongoing stomach problems. The following year of 1947, Niggeling signed with the Western League Sioux City Soos, close to his home in Remsen, where he lived with his wife and growing family. Despite being sidelined by a broken foot for six weeks early on, he put in a good season, posting a 12-8 record. In October, he once again received his unconditional release at his own request. That concluded his remarkable career in professional baseball. After that, he and Ruth purchased a movie theatre in Jasper, Minnesota, where they hoped to begin a new life. Unhappily, Johnny took sick the day of the move, and was hospitalized for several days. After a few years in Jasper, a fire destroyed the movie theatre and the Niggelings moved back to Remsen in 1950. They built a new home there, and Johnny took over an existing barber shop, which he operated for at least three years. By then, the Niggelings had four children: Janice, Susan, Dennis and John, Jr. Unfortunately, their marriage eventually failed, and the couple divorced in September 1959. Ruth was awarded the Remsen home, child support, and custody of the children. Johnny then resided in nearby Le Mars and worked at Don Curry’s barber shop there for about three years. After that, he barbered at the Grand Central Hotel in Le Mars, where he lived. Still distraught over his divorce, on September 16, 1963 he hanged himself in his hotel room. A hotel employee, noticing Johnny’s mail still in the hallway, discovered his body. Ruth had just moved to Marion, Iowa (more than 250 miles east of Le Mars) with their three youngest children, so that could conceivably have affected his mental state. Following funeral services in Remsen, Johnny was buried at St. Mary’s Cemetery in that town. Longtime area citizens still remember John Niggeling. Curry said that it was a pleasure working with him. He mentioned that Johnny liked his alcohol, a taste he acquired during his baseball career. But he added that the former major league pitcher was a nice man, never saying bad things about anyone. Describing him as handsome, he noted that Johnny had a soft spot for his children. He recalled Niggeling affectionately calling his oldest daughter “Janny” when she visited him at the shop. Today a baseball park in Remsen honor’s the memory of the area’s most notable son. Johnny Niggeling Field is situated at the site of the idyllic country town’s first baseball park. Originally carved out of a cornfield, it lies just beyond the railroad tracks in the shadow of several imposing grain elevators, the tallest structures for miles around. Remsen residents are proud of their heritage. Anyone in this town of 1,663 will gladly point out the location of Johnny Niggeling Field. Clark, Jerry E,“Anson to Zuber: Iowa Boys in the Major Leagues,” Making History, 1992. Lieb, Frederick G, “Three of Niggeling’s Five Triumphs Over Red Sox,” The Sporting News, August 7, 1941. Lieb, Frederick G,“Knuckling Down to Knuckler Brings Niggeling Success,” The Sporting News, October 29, 1942. “Age Is Certainly No Barrier For Reuss (40) and Fisk (41),” The New York Times, April 5, 1989. “At the Court House – New Suit-Decrees Placed On File Here,” Le Mars Daily Sentinel, September 9, 1959. “Ball Player Reported Sick In Cincinnati,” Remsen Bell-Enterprise, April 28, 1932. “Champs Chief Hope Lies in Uncovering Ace Among Newcomers; Niggeling of Browns Rejected by Army,” The Sporting News, November 19, 1942. “Cincy Bosses Defy Jinx By Enlarging Capacity of Park,” The Sporting News, August 10, 1939. Don Curry, telephone interview with former Johnny Niggeling employer, October 15, 2014. “Funeral Services Today For John Niggeling,”Remsen Bell-Enterprise September 19, 1963. “John Niggeling a Hospital Patient,” Remsen Bell-Enterprise, December 11, 1947. “John Niggeling Buys Movie House,” Remsen Bell-Enterprise, November 27, 1947. “Illness Gives Pirates Chance To Rally Forces,” The Sporting News, May 19, 1932. “Johnny Niggeling Released,” The Sporting News, July 3, 1946. “John Niggeling to Des Moines Ball Club,” Remsen Bell-Enterprise, June 30, 1932. “John Niggeling To Take Over Meyer Barber Shop October 1,”Remsen Bell-Enterprise, September 7, 1950. “John Niggeling, Ruth Puglesa Wed” Le Mars Semi-Weekly Sentinel, February 6, 1942. “Late Starter for Reds,” The Sporting News,August 31, 1939. “Nats Stand Pat on Pitching as ‘Best in Loop’,” The Sporting News, November 11, 1943. “Niggeling Hurls Star Game Against Wichita,” Remsen Bell-Enterprise, September 10, 1931. “Newspaper Lauds Remsen Pitcher,” Remsen Bell-Enterprise, December 16, 1937. “Niggeling a Leader in Eastern League,” Remsen Bell-Enterprise, August 23, 1934. “Niggeling Back In Action,” The Sporting News, July 9, 1947. “Niggeling Back In Stride,” The Sporting News, July 30, 1947. “Niggeling, Ex-Knuckleball Twirler, Takes Own Life,” The Sporting News, September 28, 1963. “Niggeling Has Ailing Arm,” The Sporting News, July 16, 1947. “Niggeling, Henry obituary,” Le Mars Semi-Weekly Sentinel, December 21, 1934. “Our Heritage,” Remsen Bell-Enterprise, August 10, 1989. “Radcliff Keeps Up Rat-tat-tat at Bat,” The Sporting News, August 22, 1940. “Remsen Ace Hurler Sold to Nationals,”Remsen Bell-Enterprise, December 9, 1937. “Rites at Remsen are pending for ex-major league pitcher,”Le Mars Daily Sentinel, September 17, 1963. “Too Many Nat Starters, But Bluege’s Not Beefing,” The Sporting News, March 7, 1946. Remsen Bell-Enterprise, May 5, 1932. The Sporting News, October 15, 1931. The Sporting News, September 10, 1942. The Sporting News, September 18, 1946. The Sporting News, May 14, 1947. The Sporting News, June 25, 1947. The Sporting News, October 22, 1947. 1. Henry P. Edwards, American League Service Bureau, Chicago-Special 1942 – extracted from undated news clipping posted in Niggeling family collection. 2. “Niggeling Tries to Regain Weight Loss In Illness,” The Sporting News, March 25, 1943. 3. Shirley Povich, Washington Post, June 29, 1944. 4. Baseball Hall of Fame, http://baseballhall.org/hof/ferrell-rick. 5. “Nig, as a Nat, Knuckles Into Capital Favor,” The Sporting News, September 30, 1943.